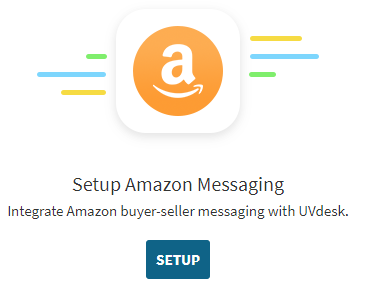 Convert the messages made by the customer on Amazon into UVdesk tickets automatically by the help of Amazon Seller Central Messaging App and you or your support staff can reply to the customer’s queries directly from the UVdesk. This app provides various Amazon Sellers an ability to interact with their customers directly through the existing help desk system. 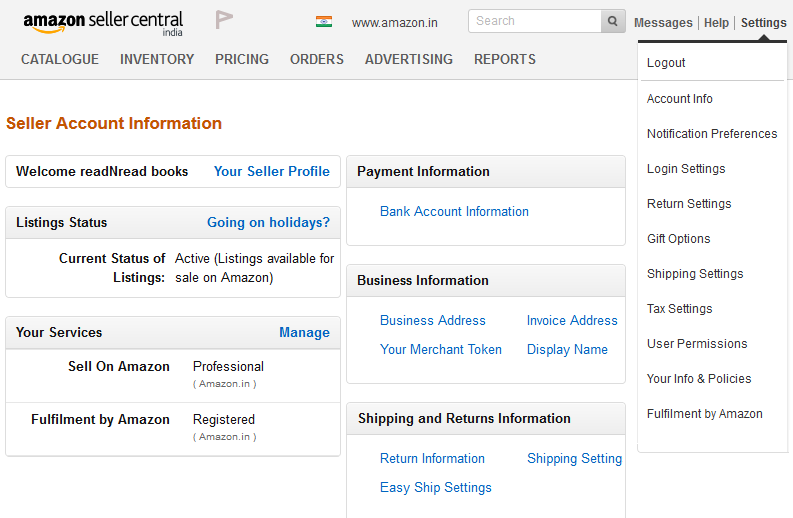 On the Dashboard, you will see "APP CENTRE" menu and under it, you will find "Amazon Seller Central Messaging". Click on that button and Amazon Seller Central Messaging App will get installed. Alternately, for uninstalling the app, go to Amazon Seller Central Messaging "Overview" section then click on Uninstall button. 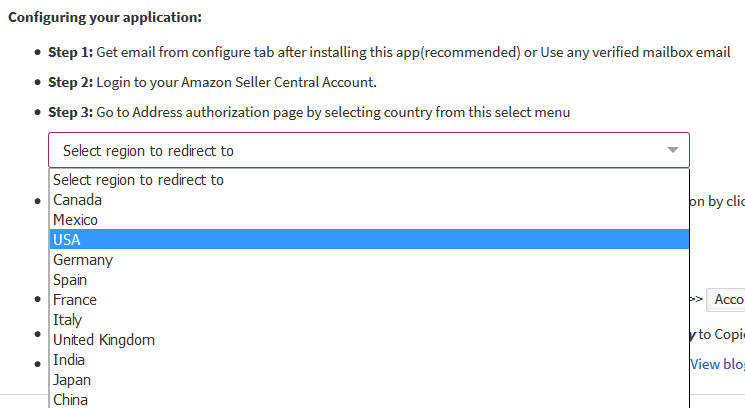 Under the "Configure", click on Setup button for configuring Amazon Seller Central Messaging App. For adding a Channel, select the Mailbox from the drop-down. After selecting the Mailbox, you will get an email address which you have to copy for configuring Amazon Seller Central Messaging App. Now login into your Amazon Seller Central Account. Come back to the UVdesk Member Portal and select the country from the drop-down under "Configuring your application" section to go to the Address authorization page. After selecting the country, you will be redirected to the "Alternative Address" page. Enter the email forwarder address for configuring Amazon Seller Central Messaging. Paste the email forwarder address in the "Approved senders" section and then click on Done button. Now follow the path: Settings > Account Info > Your Seller Profile and click on "Your Seller Profile" link. Now change "Customer Service Email" and "Customer Service Reply To Email" to the copied Mailbox email address and click on Submit button. After following the above steps, Amazon Seller Central Messaging App will get installed. 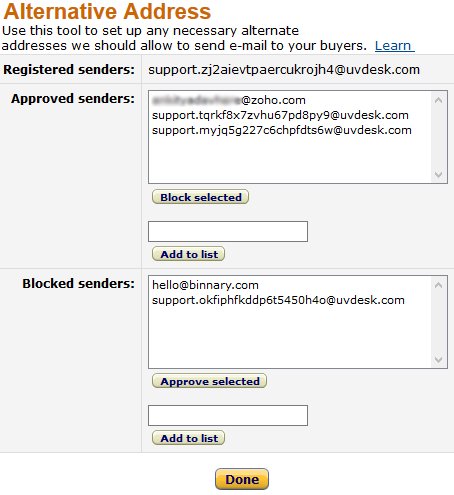 The customer can contact the seller on the Amazon platform and that message will be reflected on the Buyer-Seller Messages section as well as in the UVdesk as a Ticket.